A General Driver’s Licence is not required for drivers operating for Transportation Network Companies. To drive for a Transportation Network Company, please contact the company directly. Drivers must apply in person for a one-year or two-year licence. Please visit the Edmonton Service Centre, 2nd floor, 10111 104 Avenue NW, Edmonton, AB, between 8am and 4:30pm, to apply. Taxi and Accessible Taxi Drivers are the only drivers who can accept hails/flags from the street. All other trips must be pre-arranged. A vehicle licence is not required for vehicles operating for transportation network companies. Each vehicle can only be issued one type of vehicle licence. Vehicles are licenced and regulated by the City to ensure that the vehicle for hire is a safe option for travel. 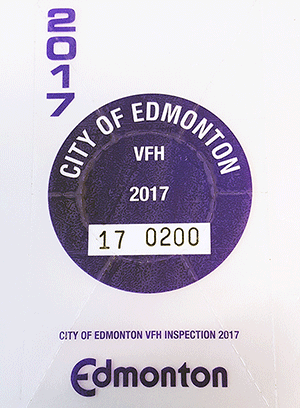 You can only apply for a vehicle licence in person at the Edmonton Service Centre, 2nd floor, 10111 104 Avenue NW, Edmonton, AB. The Service Centre is open between 8am and 4:30pm Monday to Friday and is closed on weekends/statutory holidays. Mechanical inspection are required annually and the responsibility of the owner. A current and valid Mechanical Inspection Record Form must be kept in the vehicle at all times. The person applying to receive the taxi licence or accessible taxi licence must comply with requirements for the vehicle licence, as required under section 26 of Vehicle for Hire Bylaw 17400. Photographs of the exterior or interior of the vehicle may be requested to confirm the vehicle meets the requirements to be a limousine. Any equipment or advertising visible from the exterior that makes the vehicle resemble a taxi or accessible taxi is not permitted. Private transportation provider drivers will be issued a sticker to be placed directly on the front windshield in the lower corner on the passenger side of the vehicle. A transportation network vehicle is allowed limited advertising on the vehicle. The dispatcher’s name or company logo must be displayed on the front and rear of the vehicle —on the windshield, hood, or trunk— and can’t be smaller than 8cm x 8cm or larger than 20cm x 20cm.